The angles and designs of roofs can create a hazard for trips or falls, especially when the roof is of two different heights. If this is an industrial rooftop needing periodic visits by service workers, why not add one of our custom fabricated crossovers? If the heights vary greatly, we offer the ErectaStep rooftop stairs. We will assess the site and offer the right customized solutions for you. Our custom fabricated rooftop crossover ramps and our rooftop stair and crossover platforms make traveling across a rooftop much safer. 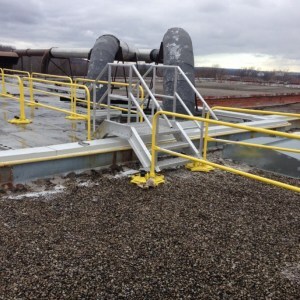 They are often used with our guardrail or warning flag systems to provide complete rooftop protection. We are pleased to distribute a large variety of access platforms from Sixaxis, including ErectaStep, RollAStep, and PerfectAStep. ErectaStep platforms are a modular platform solution for custom work platforms, rooftop stairs and crossovers and other such areas. RollAStep platforms are mobile ladders and platforms that can be easily moved into position when required, and rolled out of the way when not in use.